. : Optics & Photonics Focus :: Magical Metamaterials :. Negative refraction. 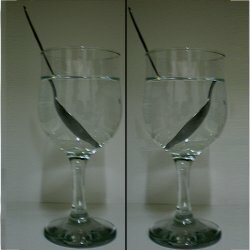 The picture on the left shows how a spoon in a glass of water appears to break at the air-water interface, and then continues inside the liquid slightly shifted to one side, but still keeping the same orientation as in air — left-to-right in this case. This optical illusion is due to the fact that the refractive index of water is different from the one of air — still positive though, as in any other natural material. On the right, there is a basic illustration of what would happen by filling the glass with a liquid with a negative index of refraction: the orientation of the spoon inside the liquid would appear to be diametrically opposite to the spoon in the air, namely right-to-left instead of left-to-right. Concepts that have traditionally been associated with the realm of magic are now being turned into reality through science. It is no witchcraft, of course, just a very good illusion! At the Hong Kong University of Science and Technology (Hong Kong, China), it has been proposed that the right metamaterial can make one object appear like another one – exactly as it happens in an illusion show. What if a teaspoon could look like a cup or a huge elephant like a tiny mouse? Illusion optics: the optical transformation of an object into another object is the title of the publication, where Yun Lai, Zhao-Qing Zhang, C. T. Chan and collaborators report their new findings. 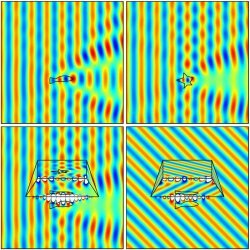 By illusion optics, "we mean the capability of making one object look like another one," the three researchers explain. "In short, we have designed a device that can make an object appear like another object in a specific range of frequencies. Moreover, there is no way for an observer, who can perceive only in this range, to realize that this is an illusion." The optical illusion takes place in a two-step process: first, the image of the real object is completely deleted by the device; then, the image of a different object is generated as a substitution for the cancelled one. The two steps are carried out by two different materials: the complementary medium and the restoring medium. After the complementary medium has optically cancelled the image of the original object, the restoring medium projects the image of the second object, generating the optical illusion. By choosing the illusion object as air, one could be able to, for example, open a virtual aperture in a wall and peep through it in a noninvasive way. The right choice of the complementary and restoring media is of fundamental importance in order for the illusion to work. Unfortunately, it happens that the right properties do not exist in known materials; this is the reason why we have to resort to metamaterials, namely manmade materials that have been engineered in order to display exotic, but useful, electromagnetic properties. "Our theory is mathematically rigorous," Lai, Zhang, and Chan explain. "There are, however, some limitations before practical implementations. The main challenge in the realization is to make some manmade material that has a negative refractive index, which is a key component in our conceptual device. At this moment, making negative-refractive index material in the microwave regime is quite feasible. It would be a big challenge to make such materials in the optical frequency range, although there have been some amazing advances in some US and European laboratories that may help realize our design in — say — the next three to five years." The illusion device at work. The picture shows clockwise from top-left: the scattering pattern of a fish-shaped object (with a dielectric constant of 2); the scattering pattern of a star-shaped object (with a dielectric constant of 4); the cloaking of the fish-shaped object by the illusion device; and the optical transformation of the fish-shaped object into the starfish-shaped object. Metamaterials with a negative index of refraction  are needed to erase the image of the first object, before the image of the second object is created in substitution by the device. Such a metamaterial can bend light in completely new and unexplored ways, making magic become reality. An example? Imagine sneaking into a room full of people without anybody noticing your presence. Thrilling, indeed. A cloak made of metamaterials could actually turn this into reality by making you invisible; it could bend the light coming from your surroundings so that an observer would not see you, but only what is behind you. This stuff is not only good for a fantasy novel, but it is actually cutting-edge science: a material which can, at one frequency in the microwaves, deflect electromagnetic radiation, thus hiding an object inside, was first experimentally demonstrated in 2006 . Soon the same effect was demonstrated at optical frequencies [3-4], before the illusion device was proposed by the researchers in Hong Kong. Here though, the principle behind the illusion device is not light bending as in cloaking devices but an exact cancellation and restoration of the optical images of the two objects involved in the illusion. Doubts about when, how, and whether similar devices will be fully functional still need to be addressed. Steven A. Cummer at Duke University (North Carolina, USA), for example, points out that "one more issue that the authors acknowledge at the very end of their publication is that they have not accounted for loss or absorption by the materials that make up their objects. We know from previous work in the past few years that for this effect to work in practice, the materials have to be made of extremely low loss materials. This is by far the biggest challenge in making the effect work in practice, and it is a big one." Despite these concerns, the high level of fascination that similar designs evoke is unavoidable and understandable. "It is pretty amazing to think that one could simply bolt a block of material onto a wall and suddenly be able to see through it," Cummer adds. "I cannot really say what a feasible practical application might be at this point, but I would not be surprised to see something physical come out of this work in a few years. This is just one example of the amazing things we can do with the concept of transformation optics, the same concept that produced the ideas behind electromagnetic cloaking. Only five or so years ago, we would have not even imagined that this could be done." And this is precisely the magic of science. D. Schurig et al., Metamaterial Electromagnetic Cloak at Microwave Frequencies, Science 314, 977-980 (2006). J. Valentine et al., Three Dimensional Optical Metamaterial Exhibiting Negative Refractive Index, Nature 455, 376-379 (2008). J. Yao et al., Optical Negative Refraction in Bulk Metamaterials of Nanowires, Science 321, 930 (2008). Yun Lai, Jack Ng, HuanYang Chen, DeZhuan Han, JunJun Xiao, Zhao-Qing Zhang, and C. T. Chan, Illusion Optics: The Optical Transformation of an Object into Another Object, Physical Review Letters (2009) 102, 253902 (link). In the video, the initial scattering of a fish-shaped object is cloaked by the illusion device, making the object invisible. In the video, the initial scattering of a fish-shaped object (with a dielectric constant of 2), is transformed in the scattering of a star-shaped object (with a dielectric constant of 4) by the illusion device.